Pictured: Northern Beaches native Jordan Lawler (AUS) booking himself a spot in the Quarterfinals at the Vissla Sydney Surf Pro QS6,000 which will run tomorrow. Manly Beach, NSW /AUS (Saturday, March 23, 2019) – The stage has been set for what is sure to be an epic Final Day of the 2019 Vissla Sydney Surf Pro and Sydney Women’s Pro presented by Sisstrevolution, World Surf League (WSL) Qualifying Series (QS) 6000 events. Manly continued to deliver the goods with more super clean 2-to-3 foot waves on offer for some of the world’s best surfers. Competitors made good use of conditions, posting some of the biggest scores of the event so far. Round 5 of the Sydney Women’s Pro presented by Sisstrevolution saw some of the strongest and most consistent performances on the entire event with excellent rides being posted in almost every heat. Former CT competitor Keely Andrew (AUS) was the standout of the round with her two-wave combination of 16.76. Keely was looking sharp on her forehand as she looks to regain her spot at the elite level on the Championship Tour. 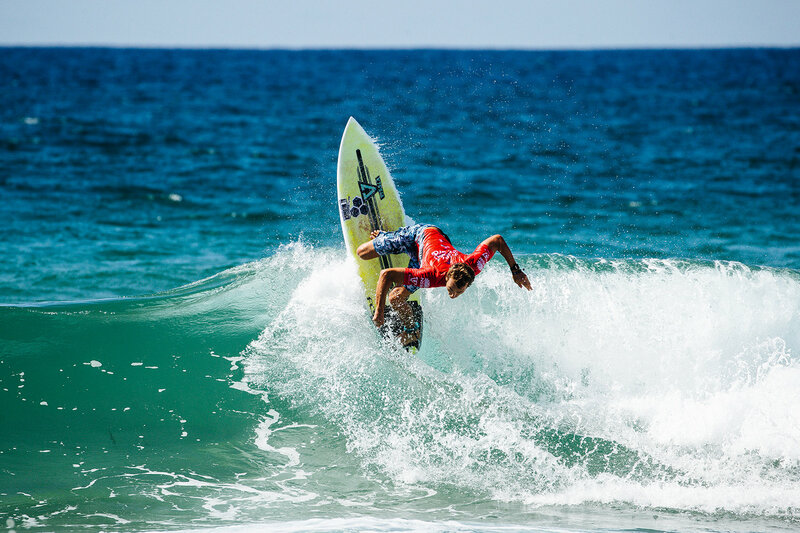 Northern Beaches native Jordan Lawler (AUS) is a surfer whose talent hasn’t translated into results in QS6,000 events with the exciting young goofy-footer struggling to progress through the early rounds. Today, in front of massive crowds and plenty of local support, Lawler put on an epic performance to book himself a spot in the Quarterfinals at the Vissla Sydney Surf Pro. Japanese competitor Hiroto Ohara (JPN) put on a polished performance for the huge weekend crowds, boosting and carving his way to a 17.27 heat total to dominate Ian Gouveia in their Round 5 match-up. Ohara is sitting in a solid position on the QS having finished just before the Quarterfinals in Newcastle and Brazil, with Manly set to be the best result of his 2019 so far. Pictured: Hiroto Ohara (JPN) boosting into the Quarterfinals at the Vissla Sydney Surf Pro QS6,000 which will run tomorrow. Former CT surfer Matt Banting (AUS) continued his solid run in 2019, taking another heat win at Manly. Banting will join fellow Aussies Nicholas Squires (AUS) and Stuart Kennedy (AUS) in the Quarterfinals along with CT surfer Jesse Mendes (BRA), Alonso Correa (PER) and Jadson Andre (BRA). Former World Junior Champion Mahina Maeda (JPN) had 2018 CT Rookie of the Year Caroline Marks (USA) on the ropes from her first wave as she posted an 8.83 for a series of huge frontside gauges. Marks fought hard to get back, but the damage was done as Maeda looks to make 2019 her year to qualify. Other winner’s in Round 5 of the Sydney Women’s Pro presented by Sisstrevolution included Sara Wakita (JPN), Malia Manuel (HAW), Tatiana Weston-Webb (BRA), Alessa Quizon (HAW) and Isabella Nichols (AUS). A Vissla Expression Session served as an interlude to Round 5 action with 11-times WSL World Champion Kelly Slater (USA), two-time World Champion Tom Carroll (AUS), NRL Immortal Andrew Johns, surfers Toby Mossop, Cam Richards, Koda Killorn and surfboard shaper Donny Brink. All competitors spent 30 minutes in a fun and lighthearted session in front of thousands of people the lined the shore at Manly. Event directors will return to Manly Beach tomorrow and make a call for the competition which will likely start at 8:00 AM AEDT with the event winner’s being crowned by days end. The 2019 Vissla Sydney Surf Pro and Sydney Women’s Pro presented by Sisstrevolution will run from March 18 – 24. For more information, results, images, highlights and live broadcast, head to www.worldsurfleague.com or check the free WSL App. The Vissla Sydney Surf Pro is a collaboration between World Surf League and Surfing NSW to run Sydney’s largest surfing event at the iconic Manly Beach. For more information and 2018 highlights, check out sydneysurfpro.com. The live broadcast will be available on worldsurfleague.com The Vissla Sydney Surf Pro is proudly supported by the NSW Government via its tourism and major events agency Destination NSW. The event is also proudly supported by Vissla, Sisstrevolution, Northern Beaches Council, Hotel Steyne, WSL, KeySun Zinke and Surfing NSW.